It's World Diabetes Day, and this year's theme is 'Diabetes concerns every family'. Having an annual awareness day dedicated to diabetes, ensures that we take the time to acknowledge the huge impact type 1 and type 2 diabetes has on the health of our community. 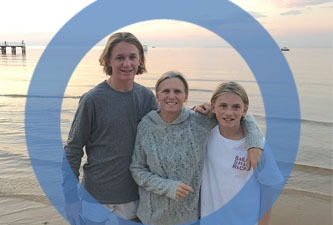 The following story originally appeared in SVI's 2017-18 Research Report and illustrates how type 1 diabetes affects not just the person diagnosed, but their whole family. David was 13 when he was diagnosed with type 1 diabetes. “I was with my Aunt Kate one night, and while I wasn’t feeling unwell, she noticed I was drinking and weeing a lot. She has type 1 diabetes, so she told my Mum. The next day we went to the doctor. David’s mother Jeni says that for the first 6 months, she thought life would never be the same again. “Initially we felt unprepared, out of our depth and shattered. But our life has returned to normal. I recall my sister Kate saying, ‘Nobody understands my condition’, and now I know what she means. Most people have very little knowledge of type 1 diabetes, and when they do, it is often confused with type 2. While David’s diagnosis came as a shock, type 1 diabetes hasn’t stopped him from leading an active life. A year after his diagnosis, he’s ridden 300km in 5 days, sailed in a state championship, rowed in the Head of the River competition, and participated in a week-long surf camp. He constantly uses his blood monitor that transmits to our phones and, when he is on camp, his teachers’ phones. An alarm sounds when his blood glucose level is too low or high. It doesn’t replace finger pricks, but gives greater peace of mind.